Since Halloween is comin’ around the bend. I thought I’d spend the next couple of weeks showing my plans for Boo Time. I’m partnering up with the lovely Clara (an awesome librarian here at the library) on a boo-hemoth Halloween party for preschoolers. 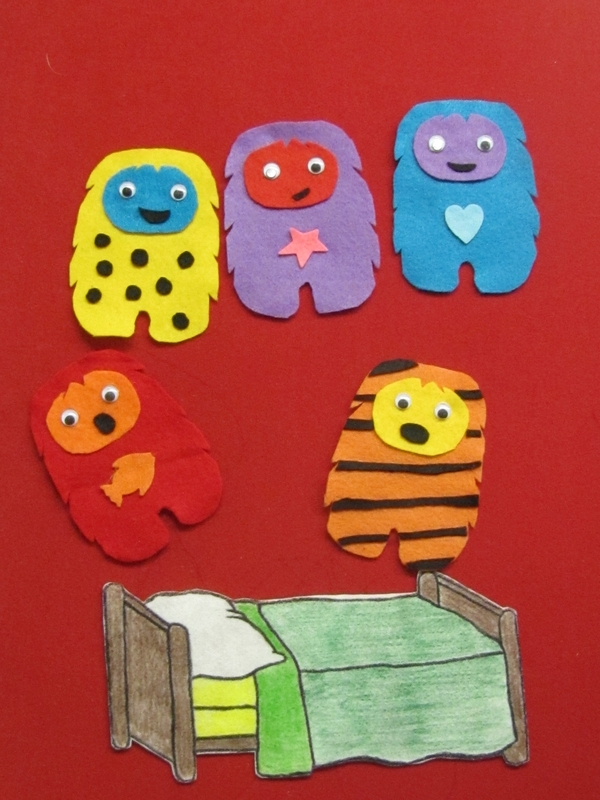 5 crazy monsters jumping on the bed. I know some people groan when it comes to this tune, but I never get tired of it. And ScribbleMonster (one of my favorite kid’s bands) played it during a performance at my library earlier this year, it was a huge hit. Everyone was tapping their toes, and singing along. So I stand by it! Oh and don’t forget to checkout the Flannel Friday Roundup. This week, Future Librarian Superhero is hosting. For a visual round-up of all postings, check out Flannel Friday on Pinterest. And check out the new a Facebook group as well now. i don’t mind at all…enjoy! That’s a great adaptation! Super awesome!